Subject: Re: Exterior Glue Failure - Part One! Good development, gentlemen. Now.....we wait. The ply center and two solid faces is the panel design Simpson Door used for its 'split-proof' panels years ago. They may still use them - it would be interested to see if their process has evolved any beyond that. Widest panels were about 26". I think the 3 ply, stable center, solid faces is a good way to go until you get up to wider panels. We often see 32" wide panels, up to 40" or more. That kind of width will present a problem for the 3 ply panels, my opinion. This is why we have developed the 7 ply panel, an effective piece of plywood that will not move, and can even be glued into the door assembly. Currently, we are using a RTV Silicone for our glass and/or panel caulking. "RTV" means "room temperature vulcanizing". I prefer all my vulcanizing at room temp. This has been 100% trouble-free. Chad, if I understand you right you are making your panels with a plywood core and solid wood glued to it on both side; is that correct? If so, that will be a recipe for failure if the door gets any direct sun. I made some floating panels only 6" wide with 3/4" Baltic birch and 1/4" veneer on both sides. They all split on the outside in the first Winter from direct sunshine on the door. I replaced them with panels made from two separate solid wood pieces separated by aluminum foil. So far, so good. I did another door with back to back solid wood panels over 12" wide. That door gets massive amounts of direct sun as it faces due West. Two years in all is well. Hi John - that is how we fabricated the original set of panels for the door. They cupped and allowed water in through the sticking. We are getting away from fabricating two separate panels because we feel the glue line is too thin to hold up in an exterior application. Are you saying that since the wood was glued to the plywood core it has no where to go (expand or contract) ? 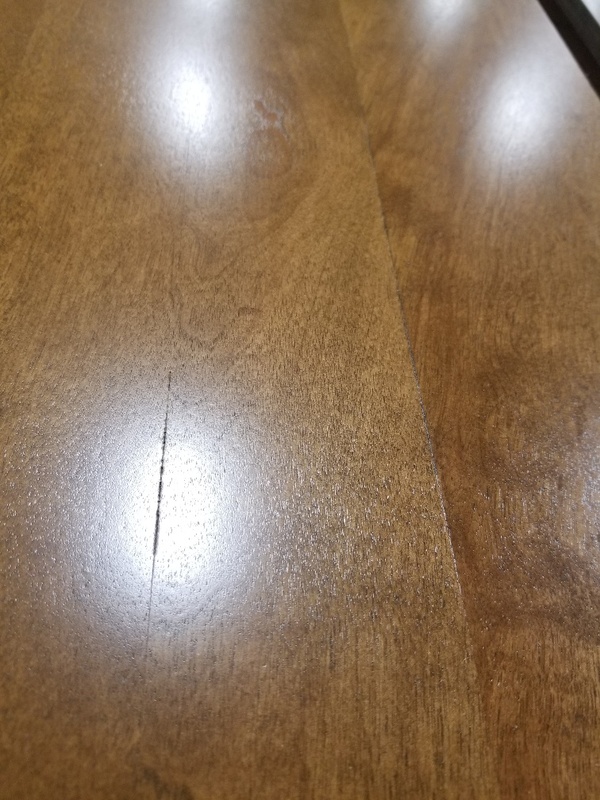 Did the wood to the exterior just crack or did the entire panel crack? 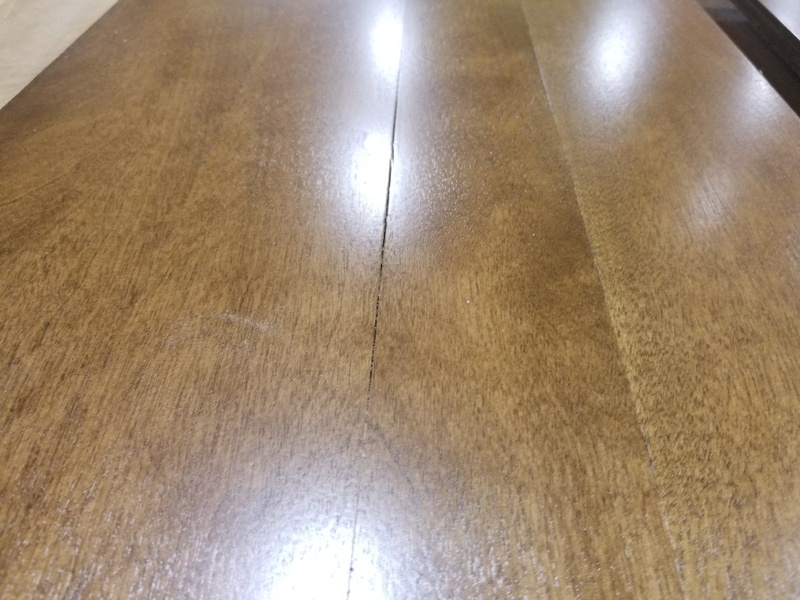 Did you check the moisture content of the wood before fabricating? Making a panel out of one piece of wood is nice because you don't have any glue lines, but we rarely have doors with that narrow of panel. Chad, only the exterior 1/4" veneer cracked on those panels, not the plywood core nor the inside veneer. They cracked right in the middle of the width, as you might expect. Those panels were glued up in a vacuum bag using plastic resin glue. The moisture content of both the plywood and veneer was 7 - 8% during fabrication in my climate controlled shop. I haven't had any back to back solid wood panels crack, but all are one piece and not more than 13" wide. I try to design doors with one piece panels to elliminate glue joints, but if I ever do have to make glued up panels I will use plastic resin glue, or some other catalyzed thermoset resin, so that it is stable up to at least 200F. I don't think cupping will be a problem if you use back to back floating solid wood panels separated by a moisture barrier, even for wide panels. If the MC is constant across the panel it shouldn't cup. The problem comes when you use one piece panels where the RH is different on the inside and outside, as it will be with an exterior door. Those will almost certainly cup, no matter how you try to hold them in the frame, and if you figure out a way to hold them so they can't cup they will crack. One way or the other, they have to relieve that stress. So what I am learning from this post is that the glue you use is pivotal on exterior doors and even more pivotal is the size of the panel. We have a hard time saying no to customers but we are going to have to evaluate our policy on how big of panels we allow. This will limit our door designs. I am still confused by how to make a trouble free panels. We will not go fabricate back to back floating solid panels because of our past issues. I like Dave Sochar's idea of 7 layers, but that will take a ton of time - that is why we decided to use baltic birch plywood for the core. John, what type of PVA glue are you using and do you lay your panels into a bead of caulk? "We have a hard time saying no to customers..." I know the story. I added a line to the warranty to exclude wide panels and iff had no effect on customer's preferences. Warranty or no, they wanted it. What I am being drawn to is a complete rewrite of the 'rules' about cross grain gluing. I break the rules all the time, with no unfavorable consequences. Thousands of others do also. Also how do describe what we can/cannot do, and what mechanisms are the ones making this so? Do I have to start all over and relearn this craft? Chad, David and some others here have a lifetime more experience than I do with exterior doors, so their advise should carry a lot more weight to you than mine. That said, what I've seen is what I've seen, and 32 years as a practicing engineer gives me some basis for understanding the forces in play with most any application. I don't use PVA glue to glue up panels. I have not yet used a glued up panel in an exterior door and, hopefully, I will never have to. If I do, I will use plastic resin glue to glue them up and I will use 2 floating panels separated by a vapor barrier. From looking at many, many doors, some not very old to ones hundreds of years old, there is a high rate of failure in wide panels. I will avoid using them if at all possible, including turning down work if I can't sway the customer to let me use narrower panels. I'd rather walk away from the job than worry about it failing. Been there, done that, and don't want to do it again. Customers want what they want, but no one wants problems. You will be the one stuck with the problem when it happens. Even if you get the customer to sign a contract with no guarantee, your reputation will take a hit. And I'll bet if you have any passion for your work you will feel responsible to make it right no matter what the contract said. Better to stand your ground or walk away. John - Good luck with limiting your builds. If you can do that and keep everyone happy, you will be ahead of the game. We have 4 people to satisfy: Owner, Builder, finisher, carpenter. Then we are happy - so 5 in all. If anyone is unhappy, or less happy, it is Acorn. The joy of owning your own business. I look at my upcoming, and I have 7 exterior doors coming up. All are one panel wide. Panels are to be 24" to 38" wide. These are all doors designed by others - architects, design professionals, or even the homeowner. To go in and try to get them to change to two narrow panels just will not work. Too many people, too little understanding. Some designs just can't change. I enjoy educating, but it has to be short and simple and then only if they ask for it. I understand David. I don't have to eat from the work I do, so that gives me more liberty than those who do in what jobs I take. I would be happy building doors with wide panels if I had confidence they wouldn't fail. But after looking at literally hundreds of doors, here and abroad, I don't. The only ones I'd take right now would be if the door sits behind a covered porch, and never gets direct sun. So what's your plan for those wide panels? 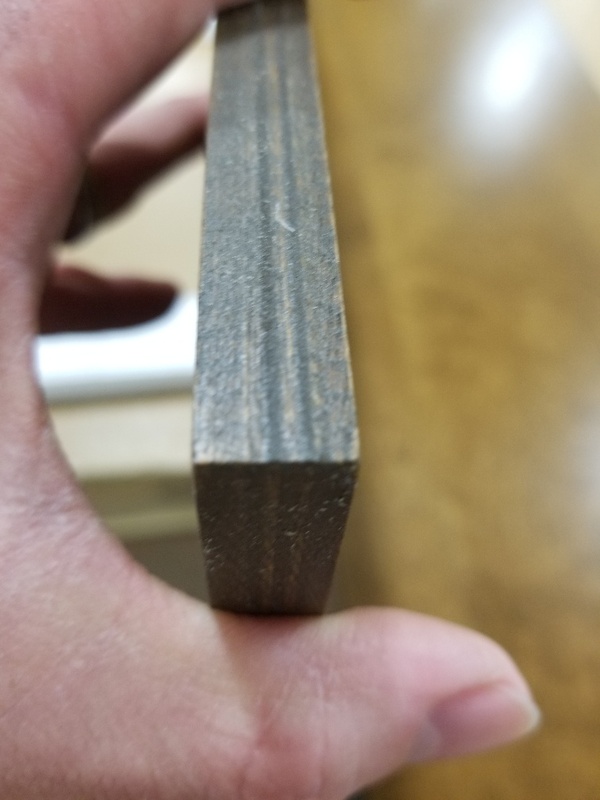 Solid wood or some kind of composite? Whatever you choose, I hope the construction allows for the panels to easily be changed if necessary. We tried to build some panels with a plywood core and we got some separation of the glue joints. The plywood core is Baltic Birch and the skins of the panels are White Birch. Plywood is 3/8" thick and skins are 1/16" thick on each side. The panels are for a 2 panel craftsman style door, 13-1/4" wide by 50-3/4" tall, 1/2" thick for a 1-3/4" thick door. Trying to figure out what we should do next with building panels. Our first problem was with our panels cupping. Now it seems like they are cracking. We would normally build two panels for each opening and set them back to back. We had issues with panels cupping so we moved to a new construction process of using plywood in the middle to keep the wood more stable. Now we are facing cracking the panels. We are now thinking of going back to gluing up boards to get one solid panel. We are using Franklin Advantage 405 glue. It is a two part glue. I would be interested in your thoughts on how you would try to solve this issue we are having. Chad, I don't think the glue is the problem; rather, it's the one piece panels with a BB core. I had much the same failures with some white oak veneered Baltic birch panels I made for an exterior door. The veneer seams began to split in less than a month after installation, pretty much as soon as we had a few sunny days and really cold nights. I replaced the panels with solid back to back panels, separated by a layer of aluminum foil and so-far-so-good. My feeling at this point is to use solid panels with as few joints as possible, none being best. If you make glued up panels the glue needs to be capable of holding up against water but also high temperature. Yours may be, I just know the particulars about it. Also, I think it is very important that the back to back panels be separated by a vapor barrier, as this will keep the moisture content more constant in each panel and help prevent cupping. Quarter or rift sawn stock will tend to cup less than plain sawn, too. Your panels failed because 1/16" thick veneer is still lumber.......albeit thin lumber. This is why commercial veneer is sliced off the logs at a typical .024".....that's less than 1/32".......or even thinner. Even at .024" thick once applied to commercially made panel stock it will get even thinner after sanding of the panel. Your 1/16" thick material acted just like any solid board would act when glued over 2' to 3' width.........it shrunk. The substrate didn't shrink and hence the cracking. I don't speak all this arrogantly but rather humbly from first hand experience ! I've been using 0.065 (1/16) - 0.10" shop sawn veneer on plywood and MDF for interior applications for at least 10 years with no seam failures. Baltic birch plywood has 13 layers in a 3/4" panel, so each layer is exactly 1/16" thick. Adding another layer of 1/16" veneer on both sides keeps everything in balance as long as you apply it cross grain. For exterior applications there are guys making doors in Germany using 6.5 mm thick veneer, which is 1/4".